Vin Brule is the Italian Style of making mulled wine, which I made to celebrate Mike's new book, Gastronomad: The Art of Living Everywhere and Eating Everything! 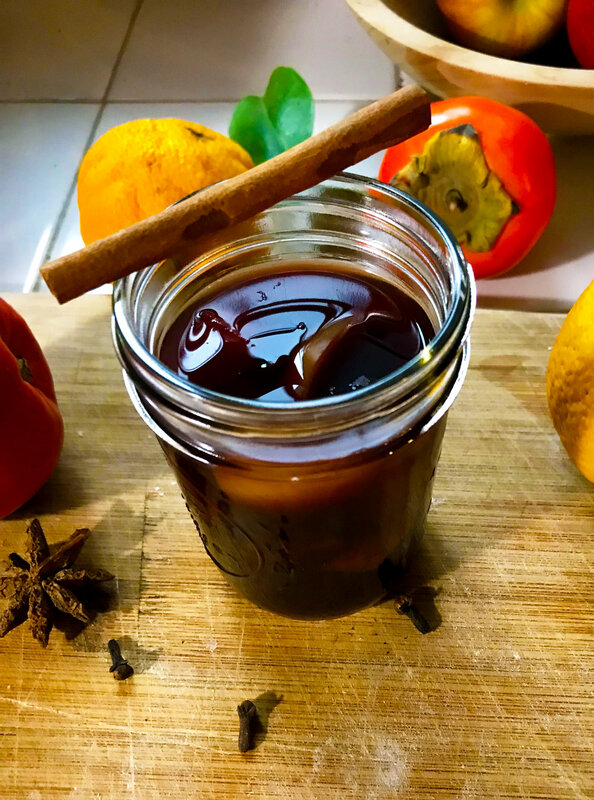 During our travels in the Veneto region of Italy recently, a dear friend shared her wonderful recipe of vin brulé, which I liked way better than the mulled wine I’ve sampled and even made myself in the United States. In Italy, vin brulé is heated over open fire, but the stove works fine! My friend adds her own twist to the traditional recipe by adding prunes. I decided to adapt it for the Spartan Diet and use dates to partly sweeten it with as well as local raw honey at the end instead of sugar. 1. In a large non-reactive heavy bottom pot (stainless steel or enameled cast iron, for example), pour all the wine and add the star anise, cloves, cinnamon sticks, ground cinnamon and ground allspice. Begin to gently simmer over low heat covered with lid. 2. With a small paring knife, slit open one side of the vanilla bean pod lengthwise from end to end. Use the pointy sharp of the knife to open the bean lengthwise and then use a dinner knife or teaspoon to slide open the entire bean pod while scraping off and collecting the tiny seeds. Add to the wine along with the remainder of the bean pod. 3. Cut prunes (without seeds) in half and add them to the wine. 4. Chop apples into one-inch cubes (seeds removed) and add to the wine. 5. Sliced off top and bottom ends of the oranges and lemons and cut them into thin slices crosswise (removing all seeds). Add the orange and lemon wheels with skin to the wine mixture. 6. In a blender, blend dates (with seeds removed) with the freshly squeezed orange juice. Blend until it has a smooth consistency and stir into wine mixture. Continue to simmer over low heat for 20 to 30 minutes covered with lid and making sure it never boils (there is no fun in the alcohol evaporating, I tell you). Set timer. 7. After timer goes off, stir in honey. Taste for sweetness and add more honey if more sweetness is desired. 8. Remove from heat or turn heat to the very lowest setting to maintain warmth (keep it covered with lid). Serve hot (without the cooked spices) in heat resistant glasses. Be sure to include some of the delicious warm wine soaked apples chunks and a fresh orange wheel garnish to make it pretty. Enjoy! With fresh ginger: add one inch of washed fresh ginger root sliced in thick slices at the beginning along with the spices. With pears: replace one apple with one large Bosc pear chopped into cubes. With Buddha's hand citrus fruit: replace one orange with slices of the delightful citrus. Note: Feel free to add another bottle red wine to reuse the delicious mixture and make more vin brulé. You may need to add more honey but the leftover spices will still work. And it can also be made with white wine.